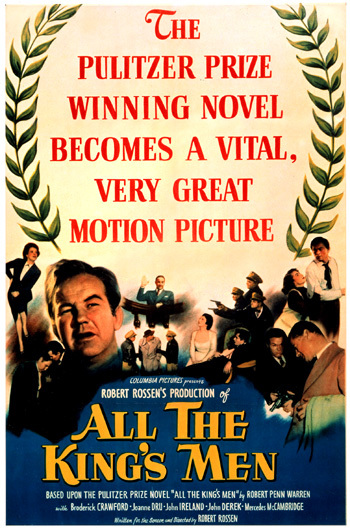 In 1949, the Best Picture Award was presented to the predicted front-runner film, All the King's Men, based on the 1946 Pulitzer Prize-winning novel by poet Robert Penn Warren about a corrupt, rising politician/boss (based on the life of assassinated Louisiana demagogue Senator Huey Long). It was the second Best Picture-winning film that was a Pulitzer Prize-winning novel (the first was Gone With the Wind (1939)). 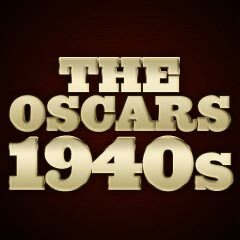 The absorbing political drama about the dangers of a populist dictatorship in the US was nominated for seven major award nominations and won in only three categories (Best Picture, Best Actor, and Best Supporting Actress). It was director/producer/writer Robert Rossen's third film (his previous films were the acclaimed drama Body and Soul (1947) and Johnny O'Clock (1947)). Director Elia Kazan's Pinky, another daring social problems drama in the 1940s about a black woman who passed as white to gain a better life, was honored with three acting nominations for all three of its female actresses. It was one of the earliest nominated films about inter-racial relations (one of the earliest was Imitation of Life (1934)). Famed danceman Fred Astaire was presented with an Honorary Award (by Ginger Rogers) "for his unique artistry and his contributions to the technique of musical pictures." In addition, legendary director Cecil B. DeMille was given a Special Award for "37 years of brilliant showmanship." Best Picture-winning director Robert Rossen, who was nominated in the Best Director category and Best Screenplay categories for All the King's Men, lost the Best Director and Screenplay races to Joseph L. Mankiewicz's A Letter to Three Wives, a biting but entertaining commentary on marriage and faithfulness in a carefully-constructed story about three wives. director Raoul Walsh's White Heat (with one unsuccessful nomination for Best Story) with a spectacular performance by screen legend James Cagney as violent, mother-fixated gangster Cody Jarrett, noted for his final words as he blew himself up: "Made it, Ma! Top of the world!" Linda Darnell's performance in A Letter to Three Wives as Lora May Hollingsway was generally considered her greatest career role, but it was not nominated for an award. In fact, none of the members of the cast (Kirk Douglas, Jeanne Crain, Ann Sothern, or Paul Douglas) of A Letter to Three Wives received nominations, although director/writer Mankiewicz received two nominations and awards for the same film. Ralph Richardson was nominated as Olivia de Havilland's heartless father in The Heiress, but he was also excellent and more impressive (but un-nominated) in his role as murder-implicated butler Baines in nominated director Carol Reed's British thriller The Fallen Idol. Although John Ford's second film in the 'cavalry trilogy' She Wore a Yellow Ribbon won the Oscar for its technicolor cinematography (Winton Hoch), John Wayne was un-nominated for his performance as Capt. Nathan Brittles. Robert Ryan was also un-nominated as Bill "Stoker" Thompson, an aging boxer who refused to throw a fight in Robert Wise's excellent and realistic boxing film The Set-Up (with no nominations).